Fruit packers who survived a fatal coach crash on the M5 in March have spoken of their ordeal as they launch a bid for compensation. The motorway crash happened amid thick fog near Frankley Services when a lorry collided with a broken-down bus carrying workers on their way to Evesham. Seventeen fruit packers who were on board have now launched a legal bid for compensation. The ordeal left many of them deeply traumatised and unable to work due to the injuries they sustained. Breaking down in tears, Marek Paruszewski said his “life flashed before his eyes” as he watched the lorry hurtle towards the coach, which had come to a halt in the middle lane of the M5. 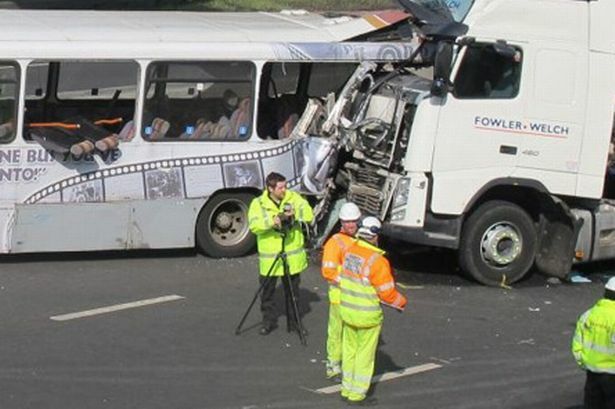 Fellow passenger Liaquat Ali, 35, a father-of-three from Smethwick, died at the scene. Lorry driver William Mapstone, 65, from Wells, Somerset, died in hospital around 15 hours after the smash, which happened at about 6.30am on Saturday, March 24. The 49-year-old coach driver, who has not been named, was arrested and released on bail on suspicion of causing death by dangerous driving. Mr Paruszewski, 36, of Smethwick, was among 40 passengers on board the coach, which was ferrying fruit packers employed by Quinton firm Fusion Personnel to a farm in Evesham. “The coach had already broken down once and the driver managed to get it started again, but within minutes of being on the motorway it had broken down again,” said the father-of-four. “We had been sat in the coach in the middle lane of the motorway for about 15 minutes so I stood up to see what was going on. “That’s when I saw the lorry coming straight for the back of the coach. Mr Paruszewski was taken to Birmingham City Hospital and treated for head and back injuries, which left him unable to continue his £200-a-week job. A man from Handsworth, who would not be named, is also among those taking legal action. “There were some people sleeping and I was on the phone when there was an almighty bang,” said the 28-year-old, who suffered head injuries and crushed legs. He tried to help victim Mr Ali. The ill-fated journey happened on what was to be Jyoti Karki’s first day as a fruit packer. She had taken the job to fund her diploma in business. “The seat behind me crushed into my legs and then I was unconscious,” said the married 22-year-old, who moved to Smethwick from Nepal 18 months ago. A former Army medic who was the first doctor at the scene of the crash has told how the carnage reminded him of his days treating injured soldiers.